What is up, everybody? Fred Lam here and welcome to our daily huddle episode number 69. As you guys all know I went on a mini vacation for about two and a half weeks. So, I apologize for not being here live for our daily huddle. Since that I’m back in North America, back in Vancouver this week and traveling again on Thursday, I’m going to do my best to be here every single day to actually answer 5 questions that you may have to get you unstuck in your business. I do have a lot of people messaging me on Facebook and Instagram asking where I went. Did I stop my daily huddles, the answer to your question is NO. The daily huddle will be here for as long as I live. I’m just going to do my best to be here live but obviously being in Asia and especially spending a lot of time in China, I wasn’t able to actually get on Instagram, Facebook, Google or YouTube. I left the social media world so I wasn’t able to actually answer any texts, in Facebook messages. I wasn’t even they actually put on any YouTube videos so my apology on that and the things but again good news, I am back right now so I’m going to host this every day and answer for 5 burning questions. Here’s the deal though possibly by around the middle of this month when I’m back from my next trip, our daily huddle will change. It will take place not in my office, but I in our studio. So, as you guys know I actually launched a series called the Print Profits Series with Michael. We use our entire studio to do that. Our daily huddle will be in there very, very, very soon. So you guys will actually not see my office where I’m at, where I work. You’ll be seeing my daily huddle inside our studio. Now, with that as you guys can actually see in the title of this video is basically Instagram. I have to say I love Instagram now. I’ve favored Instagram over Facebook especially if you are wanting to get free traffic from either the internet or basically for your eCommerce store, for your business regardless if it’s local business, digital business or an eCommerce store, I’ve discovered that Instagram, the free traffic and the exposure that you get is actually a lot better than Facebook. Now, as you all know Facebook always constantly make changes and one of the biggest update that they had earlier this year was that they are basically not showing any feeds from a Facebook page. So, that really kills your free traffic because if you were to just post something on your Facebook page, it will not get that much of a reach. So, what I’ve done two days ago I was at the airport, my flight got delayed so my flight got delayed for literally 14 hours. I was wanted to shoot myself at the head when that happens. I was like stuck and we have to do the rebooking of our ticket, we actually went to a hotel. It was really nice hotel. It was a 5-star hotel but at the end of the day, I was actually stuck at the airport for like 4 hours. So, during that time I got nothing to do other than waiting in line, I did a test on my accounts. So, I ran a post saying that I’m bored asked me anything in our answer, and I post on Instagram and I also post on Facebook at the same time to actually see what the reach and engagement actually looks like. And today I actually got you guys some results and screenshots of these data and this will actually tell you why Instagram is really now built for you to actually get free traffic over Facebook and why you should actually start focusing a lot on Instagram over Facebook when you are trying to actually engage with your followers. With that, give me a ‘1’ in the comment box right below if you guys are excited to see the results. I’m actually going to show you guys the entire result of the post that I ran. Again, I didn’t pay or boost any of the post, I simply just did a quick posting to get free traffic and I obviously got an amazing amount of results from that. I’m getting some 1’s starting to come in right now let me actually share with you so right now as you guys can see, for those of you that are on Instagram let me actually grab my phone so you guys can actually see this at the same time. If you guys can see this right now, if you look at the data over here, you will actually see that I have roughly around 53,0000 followers right now just on Facebook and I post the exact text, the exact image and with that, here the results. So, from this post over here, I got 1,630 people reached. So out of my 53,000 followers, only 1,630 of them actually saw this post. From here, I got obviously 85 comments. So, it’s not bad. It’s pretty decent but again keep in mind, I have 53,000 followers on Facebook. Now, on Instagram which I just started a month ago, I now have around 4,000 followers but take a look at this, I have a 146 comments and not only that, if we actually look at this even further down and reach 1,664 people. So, if you actually compare this and obviously I cannot compare this apples to apples but with my Instagram followers, I have 4,000 followers only but this post have reached 1,664 people; whereas my Facebook post, I have 53,000 and reached the same amount people. In fact, I actually reached more people on Instagram over Facebook and this is why and again I’m sharing this data with you guys only because I want you to know or I want you to start seeing where the engagements are at, where the free traffic’s are at right now. It’s really inside Instagram and here’s the beauty about Instagram for any of you that are running an eCommerce store – with this I share this data with you guys to share with you right now if you want to get free traffic, if you just want to actually just post something and have people to go to your website or go to your store to buy something, I would have to say hands down right now it is on Instagram. I have 10X, more than 10x, I have like 12x the followers on Facebook over Instagram and I’m actually reaching more people with my organic posts on Instagram versus Facebook. Again if you guys do not have Instagram strategy in your accounts or in your business, you’re definitely missing on a lot of free traffic right now. So, I encourage you spend some time, create an Instagram page, start posting on there, start putting hashtags on there and start building and following because you are going to get a much better reach than anything else right now if you want free traffic towards your website. Again, just sharing these data points with you guys on the discovery that I have and again I think Instagram is going to take a having a very massive breakthrough this year. In fact a couple weeks ago Facebook, has announced that inside Instagram, there are what we call the product catalog feed. So you can actually assign a eCommerce product to your posts and people can actually click on it and we’re using Shopify, it is integrated with Shopify right now so you can have a product feed right in your Instagram account, people can click on it and buy that button. So, if you’re in a lifestyle business, fashion business, apparel business, this is actually perfect for you and your business to get some organic sales and some free traffic towards your website. 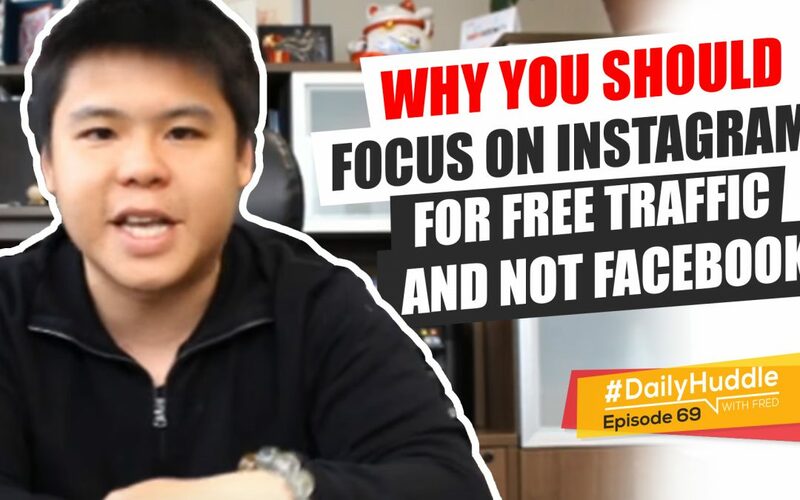 I hope that helps you guys out and just sharing with you guys that you need to start focusing on Instagram right now, especially for getting free traffic. Hello, Fred! In advance, thank you for your timing congrats for your success. As you said on an email if I have some concern I can write to you. You have so much experience in receiving payments please could you advise me on this. USA is very strict about payment of taxes and the origin of the money and they can block the money when a certain amount is received. my concern is that when I start receiving the sales payments in my personal bank account, I do not have an account for business. The bank could block my money and account because it’s supposed to be a personal account and not for a business. How could I prevent this happening? I cannot open a business bank account. I talked with an accountant but being from Venezuela which is where I live do not know about it. Please help me about this. You are an expert and I know you know what should I do. Thanks for your time. Great question! Again, your Venezuela, I’ve never been to Venezuela. So, I can only share with you action steps that may help you. It’s not going to be ones that may or will help you right away. So, the first step I would actually suggest you to do being in Venezuela first I would actually suggest you to talk to Shopify Live Chat. They are the best at this and especially if you’re building an eCommerce store, they can give you the right procedures and what merchant provider to actually use. Now, again you didn’t really specify if you’re using Shopify or not. So, I’ll talk about if you are creating an online business that it’s not an eCommerce, so with that what you can actually do is just accept PayPal. I’m pretty sure Venezuela have PayPal. So you want to check into that. Now, if you do not have PayPal in Venezuela, the last option that you can look at is to checkout.com or BlueSnap. These are two other merchant providers that you can actually look into. Now, in regards to personal accounts and in regards to business accounts again you being in Venezuela I don’t know what the policies are over there but if you can’t set up a business account, I would say you should go talk to your bank and ask them if you can actually set up maybe a checking account under your personal name where you can actually wrote everything through there and you set it up as a sole proprietorship so that way it is still your business. It is just going directly into you, not into a business account. So that’s my suggestion to you. Try it out talk to Shopify live chat and look into BlueSnap to check out or just potentially just accept PayPal for your store. [0:13:23] Question 2: Which is more important, choosing a theme that attract and convert customers into buyers or choosing the right product that the market have a broad interest in from sites like AliExpress? My question is, which is more important, choosing a theme that attract and convert customers into buyers or choosing the right product that the market have a broad interest in from sites like AliExpress? So, if you’re saying should I favor or should I focus more on the theme or on the product, I would say product because product is the first interaction that you are going to have with the other person on the other side of the screen. That is just a complete stranger never heard of you, never know of you, never seen your brand before, never went through your website before and the first point of contact is always going to be the product. So, I would say product over theme. Your other question is what’s the best way to test if a product is a winning product, engaging it in a newly Facebook page by creating a Facebook ad or some better million dollar suggestions that you personally have in mind? My answer to your question is always let the ads tell you the data. You don’t want to basically offend other Facebook pages where you go to their page or go to a group and put it in a link towards your product. You never wanted to do that, you are going to annoy the living crap out of the admin and the moderators of those groups and it’s not going to be the best practice. What you wanted to do is to run some ads and look at the data points to determine if that product is going to be a winning product or not. So I hope that helps you out. [0:15:02] Question 3: What's up Fred! How do you keep your look-alike updated? Do you update them manually every day or use any app? What’s up Fred! How do you keep your look-alike updated? Do you update them manually every day or use any app? That’s a really good question William. So, look-alikes updates on its own and at times do not update on its own. Let me actually get that straight. Look-alikes will not update if the seed lists, the initial list to run the look-alike audience it’s actually an email upload. If you upload your email address of customers and run a look-alike audience to that seed list, the look-alike audience will not update; however, if you have a dynamic event of custom audiences and you create a look like out of it, then every 3-7 days, your look-alike audience will automatically update. Let me give you a perfect example on which scenario will automatically update. So, let’s say that you created an add to cart custom audience, so anyone that actually added to cart on your website you have an audience of people, you have a segment of audience. When you run a look-alike audience of that segment and because your custom audience from the add to cart are adding in new people every day, then it will have look-alike audience updated automatically. Again, the update takes place every 3-7 days. So, in reality there’s not really an app that you need, the only manual process that you need and I share this before is that every single month add in a new email list, or a new custom audience off of your email list and rerun the look-alikes. When you have done that, make sure you simply take the previous month and the new list to create or create or look at the audience overlap to see if there is some sort of overlap and if there is an overlap, make sure you create an exclusion for the active look-alike. Very important information that you need to take place in. Now again, I know that this may be going like a little bit over your head and now we’re just through our daily huddle. Here’s what I’m going to be doing, I’m going to be launching a brand new series in the studio very soon on my YouTube channel called the Shopify masterclass where I simply create video training, create new videos for you guys every week on eCommerce and Shopify. Again with that, that’s what you want to do look-alike audience do automatically update and do not for certain type of custom audience. [0:18:06] Question 4: I’ve been optimizing my ads based on your system, my question is if I have an ad that it's already creating sales but I realized that only females of a certain age groups are buying, would you suggest I create a duplicate ad and target only females or should I edit the targeting within the existing ad? Hi, Fred. Thanks so much for your daily and providing us so much value on a regular basis. I’ve been optimizing my ads based on your system, my question is if I have an ad that it’s already creating sales but I realized that only females of a certain age groups are buying, would you suggest I create a duplicate ad and target only females or should I edit the targeting within the existing ad? Again, I would not edit the existing ad because it will reset the algorithm. I would suggest you to duplicate it. My concern with duplicating it and I’ll lose all the precious data on my existing which is already profitable. Jerry, if it is really profitable and I always say do NOT edit anything if it hasn’t break. So, it’s not broken yet, you’re making sales, you’re being profitable, do not duplicate it. Let it run. What you wanted to do is that eventually when you want to go after new interest targeting for your products or when you start to exceed or when you start to see ad exhaustion for your ad then when you duplicate the ad, use a new copy and simply just go after the female demographic that is converting for you. So moving forward, when you’re creating an ad you know that you don’t have to let Facebook figure out who the buyers are. You know that they are females. So, any of the new ad set and new targeting that you’re going after, simply just go after the targeting right away but again don’t fix what is not broken yet. So, if you are already profitable with your campaign right now, do not duplicate it. Let it keep running until it exhausts. [0:20:00] Question 5: Can you go over when it's better to use engagement versus conversions and when to use each in Facebook Ads? Also, if you install PixelBay later, can you go back and still segment audiences? Can you go over when it’s better to use engagement versus conversions and when to use each in Facebook Ads? Also, if you install PixelBay later, can you go back and still segment audiences? So, there’s two questions, first question let me answer that – engagement versus conversion. So, it is very rare in my strategies that I used engagement only because again when you advertise on Facebook, you want to tell Facebook exactly the reason why you’re advertising on there and what you want Facebook to do to optimize your ads. At the end of the day, obviously you want either a lead a sale, so that’s a conversion. Now, there are times that I do run an engagement post, not every single time but there are times that I run an engagement post and why or when I will run an engagement post is when I have a video that I can go out to the public and I want more people to watch it. I want a lot of people to watch it and when I do that, I actually have another strategy to back up or tag onto it. If I run an engagement post, I make sure it is a video post, it is video ad and when I do that, I can actually create a custom audience of anyone that watched the video 10 second, 25%, 50%, 75% or 95% of the video. I can automatically create by custom audience that I can use for remarketing purpose and look-alike audience because if I know that people have watched my video, they know my brand, heard of my name and I do not do an aggressive call-to-action on there and I just want people to watch the video, I obviously create engagement. I want people to share it, like it, comment on it so it shows up on their friends newsfeed too. Then at that point, I would create a more tactical ad that goes after the ones that actually watched the video. Again, when that happens, I go after conversions now. So, my goal at the end are always going to be conversion. When do I use engagement? It’s when I just want exposure to a video that I have that I want the public can actually see and learn more about me, that’s when I will actually do that. Your last question is can you install PixelBay later and go back and still segment audiences? The answer to your question is YES you can; however, I suggest you to start right away with it only because in case it missed some kind of data, there may be possibility that happens, but again you can install later it is really up to you. Again, today is Monday and I know that a lot of people asked about this. I get a lot of Facebook messages asking me if they are going to be the winner for my Kickstart 500 grants. Now, for those of you that have just recently followed me or don’t know what this Kickstart by 500 grant is – every single Monday, I will give away $500 to an individual who is wanting to build a business online but don’t have the budget to do so. $500 is more than enough for you to actually get a website up and start driving traffic to your store. For those of you that didn’t win, don’t worry if you have applied and fill in the application form, you will eventually win. For those of you that have not filled out the application form to get qualification or to sign up to get into our draw every single week, make sure you go to www.fredlam.com/500. There’s an application form that you got to fill in make sure you fill in that. Now why I chose Chris? He actually inspired me. He said my wife and I have a son who is autistic. He is profoundly autistic as a child but has improved to the point now that he is in junior in college about much difference all between himself and others well except that he is particular gifted in history which is his major. So, what he wanted to achieve is to want to serve people in their journey to parents of a child of having autism. This is actually very important. I know my good friend Chris Rector has created an entire video making the autism awareness and again kudos to you guys that are trying to make an impact or are already making an impact to the community for kids that have autism. I know that speak really loudly for me. It really warms our heart when I actually see people doing their best to help these kind of people people that have autism so at the end of the day, that’s why I chose Chris is really because his story and his goal really inspired me too and I believe that would do so too. With that being said, again, every day we’re going to be having our daily huddle and I will do my best to get on 6PM Pacific and 9PM Eastern so make sure you stay tuned to Facebook, Instagram and YouTube whenever I come on live and if you have any questions that you want to get featured in our daily huddle make sure you go to www.fredlam.com/ask. That’s it for today’s daily huddle. I look forward on seeing you guys tomorrow.